Almost every Aussie home needs a lawn mower; after all, they are the key to keeping your backyard from turning into a jungle! The downside is that these grass-clipping machines are rather big, bulky and subject to being damaged by the natural elements. Solution: invest in a small lawn mower shed to keep this expensive gardening tool secure in your backyard. 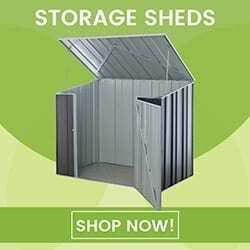 Unfortunately, not just any garden shed will do! 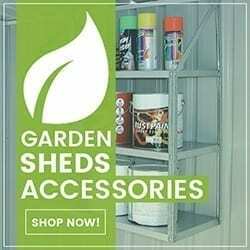 Here are a couple of steps to follow to ensure you are selecting a lawn mower shed that will fit your gardening tools in, and also suit your backyard. How big is your lawn mower? How big is your backyard? You’re going to have to get a couple of measurements before hitting that ‘Buy Now’ button. You want to make sure your new garden shed fits nicely in to your backyard, and that the door has enough clearance to easily fit your lawn mower inside. Is approx. 1m from the side and back boundaries. Must not be placed in the between your house and the front boundary. 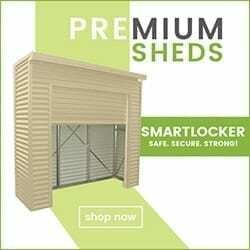 View our video on Garden Sheds and Council Approvals. You want to make sure that your new lawn mower shed is the right aesthetic fit, so ensure you select a colour that matches the rest of your property. Remember, you’re purchasing a garden shed to get rid of the eyesore – not to create one! Garden Sheds are a great storage solution, especially for your lawn mower, you just need to make sure it is also the right fit for your property. Tick all the above boxes, and then you will be ready to add that garden shed to your cart! Happy Gardening!